Last year's experience left me a bit embarrassed and discussed with myself. Today, Thursday on day 32 of my 2016 Travels I had just bought some 6" hiking boots at REI when I came out and found my rear drivers side tire nearly flat and from the wear on the sidewall it's been going flat for some time. Close up you can see the sidewall wear. It had been previously suggested that I carry a compressor and I wasn't carrying one. 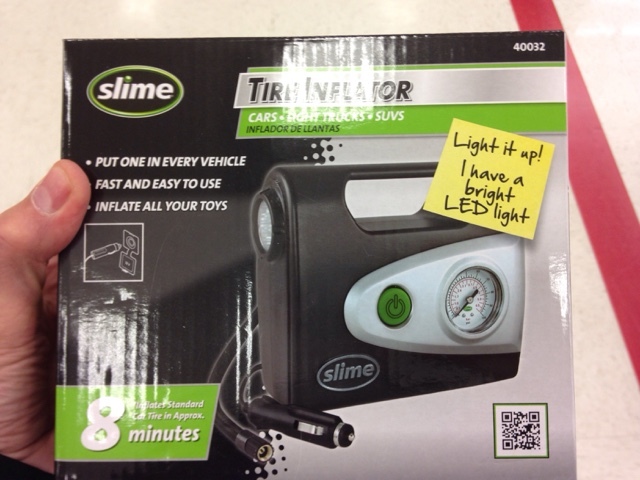 To my luck there was a Target store next to the REI and I went on and bought the smallest one they had that was 12 volts. 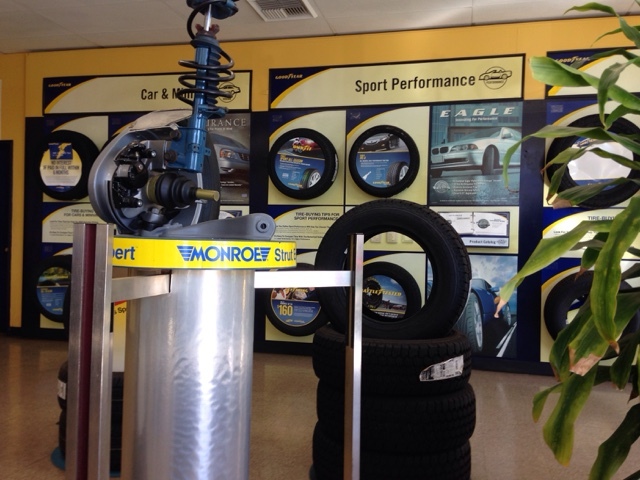 Here I am at the Goodyear tire store in Seaside, CA asking about getting my flat fixed. 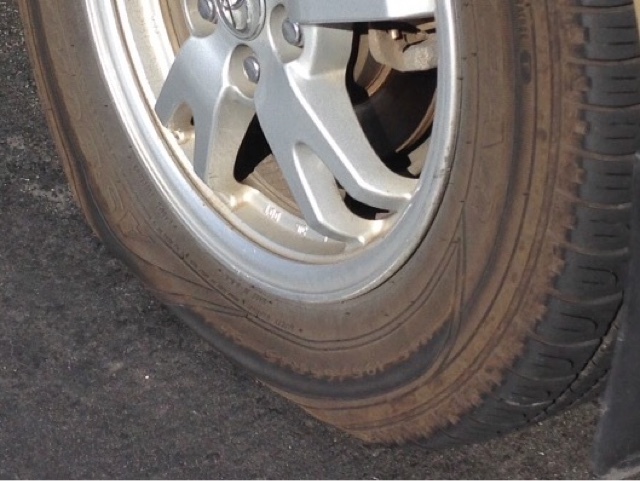 The answer was that they found a slow leak, but they couldn't patch it as the pin hole was too close to the sidewall but still on the tread. There was no charge for the diagnosis, but if repaired it would be $30. The tire needed to be replaced. My tires are all with good tread so a single should be ok.
Now the hunt for a tire begins as I have all season radials and they don't sell all season there as there is no need. 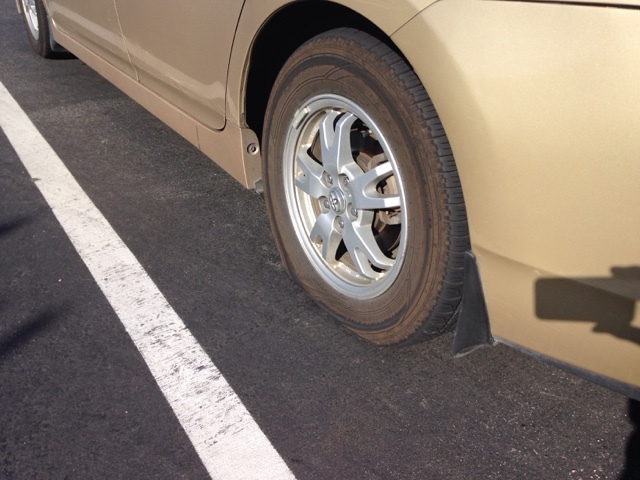 They called stores 1 hour away and none had one so they put the tire on my car and I walked out of the store. I planned to leave first thing in the am (Friday) to head back to Slab City to partake in a post RTR subgroup gathering for the weekend. I figured I would look for a tire on the road as long as I kept the tire up to pressure I should be ok.
Then a light went off in my head. I went back in the Goodyear store and asked if they ordered the tire when would they get it? The manager was now there at the counter and said "It's before noon when the truck leaves the wearhouse, so if we get an order in now and call them to get it on the truck we can have it at 4:00 pm today." I got a call at 3:30 pm from the manager and he told me the tire didn't make it on the truck so he ordered another from another supplier that would be in for 10:00 tomorrow (Friday). This would delay my plan of leaving by 3 hours but would be easier than trying to find a tire on the road. 8:00 Friday morning while I'm getting ready to leave Monterey the manager called me to tell me the tire was in. I headed right over only showering and not shaving as I had a long drive and wanted to get on the road as soon as possible. They put the new tire on in about 20 minutes so I was on the road by 9:30 after paying $130 for tire, mounting and ballancing. 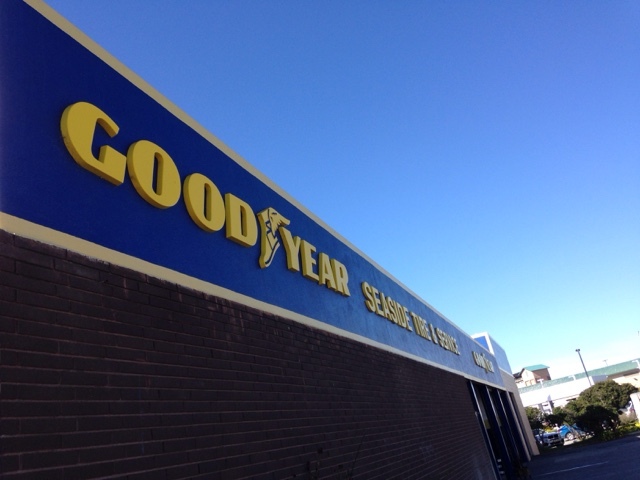 I was very happy with the service as they tried hard to get the tire the day before. The young lady at the desk apologized for not thinking of ordering the tire to get in the truck for 4:00, but that may be in part me saying I was leaving early Friday morning.